The exterior of this historic building is adorned with bright red and white wooden shuttered windows, blending in beautifully with the atmosphere of Old Quebec, Canada. 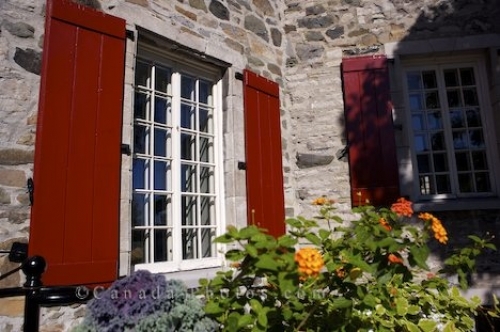 Adorning the stone walls of the Maison Chevalier along Marche Champlain in the Quartier Petit Champlain in Old Quebec City, are historic wooden shuttered windows. Dating back to the 17th century, the windows have been repainted and renovated but still carry the charm and uniqueness in which this historic building emits. The construction of this building was inspired by classic French with its design consisting of firewalls, chimneys and high vaulted ceilings. The building was built with three different types of stones with the ones used to create the opening around the doors and windows with a type of stone called Pointe-aux-Trembles. Picture of the wooden shuttered windows on a historic building along the Marche Champlain in Old Quebec in Quebec City, Canada. Windows of Maison Chevalier along Marche Champlain, Quartier Petit Champlain, in Old Quebec, Quebec City, Quebec, Canada. UNESCO World Heritage Site.